This is a fun cake. Aside from the fact you get to tell people the secret ingredient, preparation is so simple! You just throw everything into one bowl, mix, pour in the pan and bake. As mentioned, the cake is pretty firm, but it is still moist. 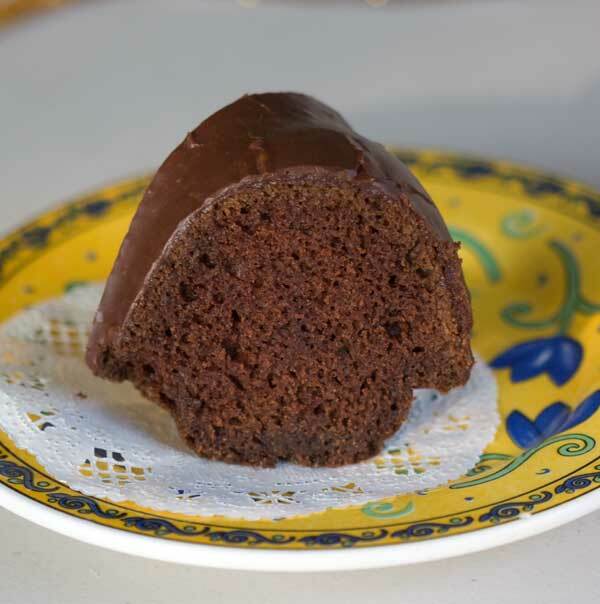 As for the glaze, it was fantastic and would be good on just about any chocolate Bundt. Alas, I had to cheat and use a mixture of melted Ghirardelli semisweet and bittersweet chocolate chips in place of chopped semisweet chocolate, but the substitution worked well. I’m usually hesitant to substitute chocolate chips for semisweet chocolate because there have been instances where the extra ingredients in the chips made the baked good or glaze dryer or stiffer, but it didn’t seem to be a factor here. The original ‘Tato Cake recipe is on Hungry Jack’s website (and in loads of other places because this one is an old classic), and my version is below. Instead of using 1/2 cup of butter, I used a mixture of butter and oil because I’ve found that a little added oil adds moisture. I also used White Lily instead of regular all-purpose flour. If you don’t have White Lily, you can use all-purpose or cake. Preheat the oven to 350°F. Spray a 12-cup fluted tube pan or 10-inch tube pan with no-stick cooking spray. Put the chocolate and potato flakes in a mixing bowl. Add boiling water and let stand 5 minutes or until potato flakes are softened and chocolate is melted. Stir to combine. Add flour and all remaining cake ingredients except chips, to potato flake mixture. Blend at low speed until moistened. Beat 3 minutes at medium speed (Note: I just mixed everything really well with a spoon, then stirred for about a minute to remove lumps. There were still a few lumps from the potato flakes, but they were gone after baking). Make sure batter is not to warm, then throw in the chocolate chips (if using). Pour batter into prepared pan. Bake 45 to 60 minutes or until toothpick inserted near center comes out clean. Cool upright in pan for 30 minutes. Invert onto serving plate. Cool 1 hour or until completely cooled. To make the glaze, melt 4 oz. chocolate with 3 tablespoons water and 1 tablespoon butter in small saucepan over low heat. Remove from heat. Add powdered sugar and 1/2 teaspoon vanilla. Beat until smooth. Stir in additional water, a few drops at a time if needed (I didn't need any), for desired glaze consistency. Immediately spoon glaze over cooled cake, allowing some to run down sides. I do that too, and it does help. Maybe it has something to do with the batter heating up and forming a thin, baked shell of sorts before the solid shortening/butter/flour or whatever you use melts? Not sure. 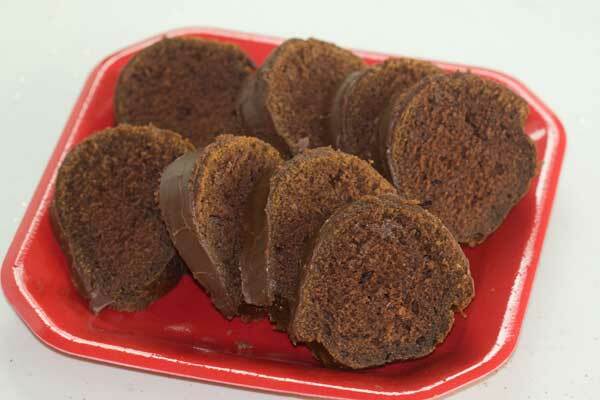 I often have cakes stick in my bundt pan, too, even though it is supposedly “non-stick.” I have found that putting it in the fridge after it’s greased and floured, while I’m mixing up the cake, seems to help. I have NO IDEA why this would be so, and maybe it’s a coincidence, but it’s worked several times in a row. Hope you like it and have fun serving it! I should also note that I used 85 percent Ghirardelli squares for a portion of the chocolate in the cake and in the glaze. The rest was semisweet. There is so much glaze! I also sprinkled toasted chopped pecans on the glaze. Haven’t tasted it yet, but it looks great! Neat! I’m anxious to hear what you think. The recipe originally called for pecans, so those should work well. I have this in the oven now! I stirred in chopped pecans instead of chocolate chips… The batter was yummy! You’re right. This is fun. It would be entertaining to tell people their cake had potatoes in it..
Mmm, looks good. You just might convince me to try Hungry Jack in baking. Jan, try using Baker’s Joy if you haven’t already. It always works for me. Glad you were able to get a new coffee maker. It looks good. 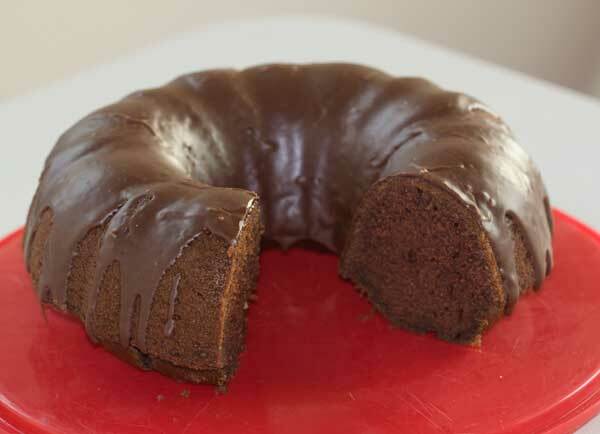 I always have trouble getting bundt cakes out of the pan. What’s your secret? Incidentally, I won that Keurig coffee maker through you. It worked well 2-3 weeks, then I started getting a “prime” message. I had to look on the internet, and it has something to do with the water. Gets an air bubble or something. I start getting it several times a day and it was frustrating to me. Keurig sent me a brand new one. I thought that was pretty super, You can buy coffee from their site also and I think their prices are reasonable. I like the Folgers mug I got too. At first I thought it was too big and would be heavy, but I tried it in the microwave and it didn’t get boiling hot I look for mugs like that. Definitely not made in China.